From the forbidding, blackened towers of their sprawling dread city-port Karond Kar, the Dark Elves – or Druchii, as they are called in the Elven tongue – wile away their extremely long lives indulging in internecine plots, twisted schemes, depraved, debauched acts of all kinds, and of course wanton cruelty, sickening torture and bad, old-fashioned death. With devotions such as these, you would think that a life of adventure on the perilous high seas of the Great Ocean – endlessly fighting, raiding and plundering, at great personal risk – would be far too much like hard work for the hedonistic Druchii. Yet there are some among their number who eschew the decadent lifestyles of their peers, throwing caution, and themselves, to the wind, quite literally. Of course, for many the intention is to escape the dangers of Naggarothi life, where execution or murder, always accompanied by a smile, if not maniacal laughter, are always close by, if not waiting around the next corner. 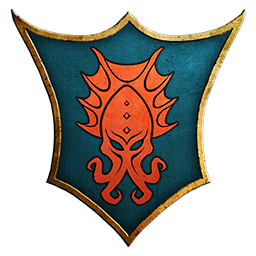 Not so in the case of Lokhir Fellheart – the dreaded ‘Krakenlord’. He was born to ply the rolling seas, bringing death to those stupid enough to attempt to traverse them, and fire, terror and enslavement to unsuspecting foreign shores. Countless ports and coastal cities lie ruined and ablaze in his wake, for Fellheart is the latest in a long line of doom-bringing admirals to command the Black Ark known as the Tower of the Blessed Dread. As a result of his terrible exploits, Fellheart has accumulated much plunder – wealth beyond measure, in fact – along with far greater glory than all of his forebears combined. More treasure flows through Karond Kar than ever before – of both the shiny sort and the fleshy, enslaved kind – earning him the grudging respect, if not quite the trust, of the city-port’s Dreadlord masters. But that is enough for Fellheart, for he cares little for politics or anything much except loot and plunder and what it can buy him – the loyalty of his Corsairs and the lavish bribes he pays to insalubrious officials that enable him to operate freely. Although he keeps the best pieces for himself, Fellheart is admired by his crew for his generosity, a quality not normally associated with Dark Elves! They also trust him due to the personal courage he displays in battle, a dangerous habit that other Druchii admirals tend to lose as soon as they can, lest their days on account upon the Great Ocean be very few in number! It is certainly true that the privations of sea-life, including his high-pressure command, have done little to blunt Lokhir Fellheart’s swordplay – he fights as naturally as he reads the oceans. Well aware that the loyalties of pirate crews hold only as long as their captain’s reputation, Fellheart relentlessly slays enemy heroes, tossing their severed heads onto an ever-growing pile, knowing full well that every skull adds another page to the book of his legend and gives mutineers more than a few compelling reasons not to cross swords with their captain!